Share your story and stay connected with us through Facebook and Twitter! Click here for the latest updates and stories. Growing the game of golf. One recycled club at a time. Spare for Change is a non-profit 501 (c) (3) organization with a mission to grow the game of golf regardless of your age, background or experience level. Let's put a golf club in everyone's hand. Even though our primary goal is to give underprivileged kids here in Hawaii the opportunity to make golf a reality, we believe everyone has the opportunity to learn the game of golf. By learning to play golf, opportunities are created for personal and professional growth at all stages in life. To provide these opportunities through golf, Spare for Change recycles unused golf clubs and puts them in the hands of new players. As we grow, so does our mission. Since we became a 501 (c) (3) in 2011, we have given out over 15,000 golf clubs to kids and adults. It is just the start for what Spare for Change can do for the game of golf and to improve the lives of others by playing golf. Golf is another language! A couple of ladies with their recycled sets to start out their golf lives. One of them is going to be a star on the Lady Lahainaluna Golf Team. 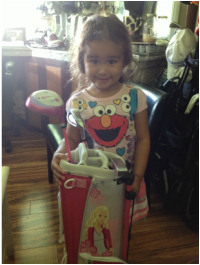 Mia and her first set of golf clubs and Barbie bag. This is what our non-profit is all about. Hudson with his recycled driver being used as a putter. At age 2, he is hooked on golf. He calls me Golf Ball. My new students from Alaska that come to see me each year since they started playing golf. Spare for Change has not only given thousands of clubs here in Hawaii, but our clubs have gone to every state in the U.S. Thanks so much for gifting Jude his new putter at the Kapalua Sentry Tournament! He has been putting non-stop in our living room and so proud of the putter! Thanks again for making a difference and for rejuvenating our son's interest in golf!!! That was so cool of you."